ADF-STEM (annular dark-field scanning transmission electron microscopy) as the main type of DF(dark-field)-STEMs is a powerful and common technique in modern EMs (electron microscopy) for acquiring high resolution images of materials, as presented by the pioneering works of Crewe and coworkers [1,2]. ADF-STEM is performed by collecting the electrons that have been scattered away from their incident direction. Figure 2799a shows the positions of the detectors which can be installed in a STEM system. 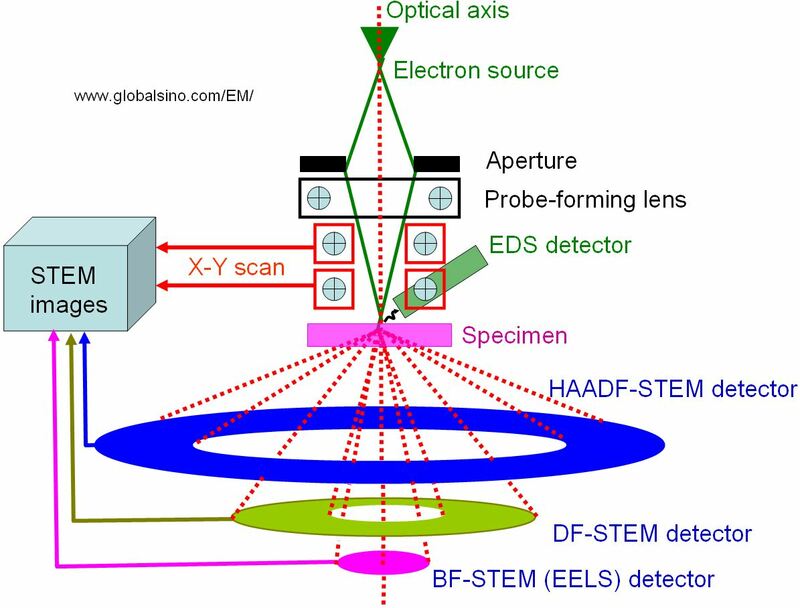 Depending on the scattering angle of the transmitted electrons, various signals can be detected as a function of the position of the scanning probe: BF (bright-field)-STEM, DF (dark-field)-STEM or HAADF (high angle annular dark field)-STEM. The DF detectors are annularly shaped to maximize the collection efficiency and the range of the collected scattering angles can be adjusted through the magnification of the intermediate lenses. Figure 2799a. The positions of detectors in STEMs. Figure 2799b illustrates the comparison of the main contrasts in both CTEM and STEM modes. Figure 2799b. Comparison of the main contrasts in both CTEM and STEM modes. J. Wall, J. Langmore, M. Isaacson, A.V. Crewe, Proc. Natl. Acad. Sci. USA 71 (1974) 1. A.V. Crewe, J.P. Langmore, M.S. Isaacson, in: B.M. Siegel, D.R. Beaman (Eds. ), Physical Aspects of Electron Microscopy and Microbeam Analysis, Wiley and Sons, New York, 1975, pp. 47–62.